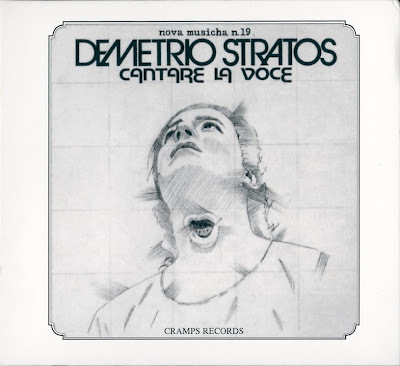 One of the most creative artists in the whole italian rock scene of the 70's, Demetrio Stratos (real name Demetrious Efstratios) was in fact born in Alexandria, Egypt in 1945 from a greek family, and came to Italy in 1962. His first musical experiences came in the early 60's, first as keyboardist and later as singer, and he joined a popular beat group, I Ribelli, that released their eponymous album for Ricordi in 1968. When I Ribelli split he was signed to Numero Uno, that issued his first and only single in 1972. Daddy's dream, an unsuccessful attempt to launch Stratos as a commercial singer that went unnoticed. In the same year he formed Area, one of the most interesting and influencial italian progressive bands. His works with Area are well known and documented, but Stratos kept following his studies on the use of the human voice, and his solo albums are a great demonstration of his capabilities. He collaborated with various italian and international avantgarde artists, and guested on many contemporary music albums. In 1979, along with Area's guitarist Paolo Tofani and former PFM founder member Mauro Pagani, he recorded a live album called Rock and roll exhibition, a sort of divertissement based on the reworking of rock'n' roll classics and distant light years from his avantgarde interests. This was his last record release, as he died in New York on 13th June, 1979 of medullary aplasia. The day after, a great celebrative concert was held in Milan with 60000 people attending. A posthumous album, Recitarcantando, recorded live in 1979 with Lucio Fabbri, was released in 1980 by Cramps.